1. God, named Love, whose fount Thou art. Love. 2. How high Thou art! Our songs can own. Divine Perfection. 3. Of all the thought of God, that are. Death. 4. What would we give to our beloved? Pt. ii. of No. 3. 5. When Jesus' friend had ceased to be. Friendship. Based on the death of Lazarus. These hymns are in Beecher's Plymouth Collection 1855; Hedge and Huntington's Hymns for the Church of Christ, Boston, U.S., 1853, &c.
Elizabeth Barrett Browning (née Moulton-Barrett, /ˈbraʊnɪŋ/; 6 March 1806 – 29 June 1861) was one of the most prominent English poets of the Victorian era, popular in Britain and the United States during her lifetime. 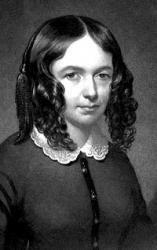 Elizabeth's work had a major influence on prominent writers of the day, including the American poets Edgar Allan Poe and Emily Dickinson. She is remembered for such poems as "How Do I Love Thee?" (Sonnet 43, 1845) and Aurora Leigh (1856).